I should note that the Chinese may not be the original after all. Instead, the person who made the sign may have started with the English (which is widespread in China [see below]) and attempted to back-translate into Chinese, with disastrous results. For the first error, I suspect that the sign-writer was somehow confused by the homophonous expression xiūhù 修护 ("under repair / maintenance"). 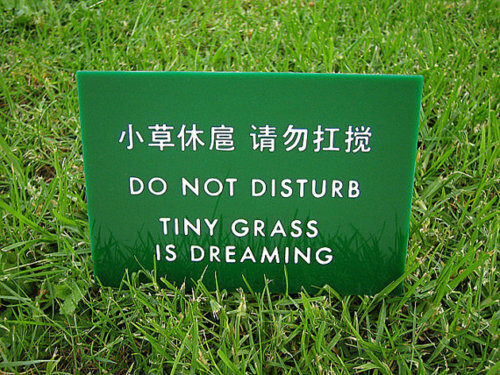 It would have been more natural to say that the tiny grass is xiūxī 休息 ("resting") or, to match English "dream" in what I suspect might have been the impetus for the wording, zuòmèng 做梦 ("is dreaming"), mèngxiǎng 梦想 ("dream"), or some other poetic expression for "dream" containing mèng 梦. The second error is probably orthographic, since it would be perfectly acceptable to write dǎjiǎo 打搅 ("disturb") in that position. When written hurriedly and sloppily, dǎ 打 and káng 扛 resemble each other. It would also be perfectly acceptable to write dǎrǎo 打扰 ("disturb"). The fact that dǎrǎo 打扰 ("disturb") and dǎjiǎo 打搅 ("disturb") are synonyms and sound similar may also have contributed to the confusion. The Russian rendering is the poorest of all the translations, using a form of the verb vkhodyat входят ("enter") instead of bespokoit' беспокоить ("disturb"), and mentioning nothing at all about tiny grass that is dreaming. Taking a little rest (lit. : in the middle of a little break); please refrain from knocking. And now it's time for me to take a rest; please don't disturb my dreams. I've seen these and similar poetic signs turn up on Engrish sites – only to look at the Chinese and decide that it's quite a good translation. The Russian rendering means: "Not an entrance". Входят means "they enter"; what you should have written is "a form of the Russian verb входить" since presumably you intended to give the base form of the verb. Except that's not really accurate either. Вход is actually a noun meaning "entrance," so what the Chinese sign has written on it could rendered as "Not an entrance." Nonsensical…but no more so than notions of dreaming grass. Great post. The pinyin for 休息 needs correcting though (in both places). Thanks for spotting that (2nd tone instead of 1st on the second syllable). The pinyin for 休息 has been fixed. I have seen a similar sign in the US (where I live in New Jersey, in fact), obviously without Chinese, on the grounds of a private school. To the best of my memory it's something like "Shh, the bulbs are asleep for the winter. Please don't walk on them so they can turn into beautiful flowers in the spring". The Russian actually means "don't entrance". 'Not an entrance' needs "nyet" not "ne" and should also have the genitive of negation: входа нет rather than не вход (note the reversed word order, too, which is standard). @The Ridger: This is an odd thread to argue the finer points of Russian translation, but входа нет is actually better rendered as simply "No entrance" (as an injunction on a sign) or "There's no way in" (as someone's observation). Is it bizarre to find "tiny grass is sleeping" unnatural? I would have expected something like "The little (young) grass is sleeping" instead. But maybe I'm just more sensitive about missing particles. "Not an entrance" and "no entry" are both found on signs, and they mean about the same thing. And sure "не вход" can occur in a larger context but by itself it is, as you agree, meaningless. Something in the comments regarding the pinyin for 休息 caught my eye. Victor Mair had originally put the second syllable for 休息 in the second tone (xí) but Peter pointed out that it needed to be corrected, which Victor later “fixed” (sic). I thought Victor was right the first time around because for all I know, 息 xí is pronounced with the second tone in Taiwan. Without exceptions, all its usages carry this tone, such as in 休息 xiūxí ‘to rest’, 訊息 xùnxí ‘information’, 消息 xiāoxí ‘news’, 利息 lìxí ‘loan/savings interest’ (as well as a few 4-character idioms 息息相關, 息事寧人, 偃旗息鼓), etc. Little did I know that it is pronounced with the first tone (xī) in China. After Victor made the correction, I looked up Xīnhuá Zìdiăn (pocket version) and found that it is indeed given the first tone. I imagine that, if Victor were a school kid in Taiwan, his teacher would certainly ask him to correct it back to the second tone. Out of curiosity, I checked other words in the group carrying the 息 phonophore. 熄 ‘to extinguish’ is xí in Taiwan but xī in China, the same dichotomy as for 息. Interestingly, for 媳 ‘daughter-in-law’, the Chinese side agrees with that of Taiwan, xí. Venturing further, 昔 ‘formerly, of old’ and 惜 ‘to love, pity’ are xí in Taiwan but xī in China. 夕 xì ‘evening, dusk’ and 汐 xì ‘night tide’ have the fourth tone in Taiwan but have the first in China (xī). The tones of all these words as used in Taiwan conform to those given in Matthews’ Dictionary (1931). Because the Nationalist Chinese brought the Standard Modern Chinese to Taiwan in 1949, these tones must be what were prevalent in China before 1949 and become preserved in Taiwan. Therefore, we can deduce that the change in tone must have occurred in China after 1949. There is an interesting precedent in history: the Sephardic Jews who were expelled from Spain in 1492 preserved until recent times the archaic forms of medieval Castilian in the Balkan. A final note, all the words discussed above had the entering tone (入聲) in Middle Chinese which is preserved in Taiwanese as well as in other southern Sinitic languages. The entering tone began to disappear from northern/central China during the Song Dynasty. Now we are seeing the second phase of changes taking place in China in our lifetime. Many thanks for your very careful, detailed, and illuminating description and analysis of the problem. I learned the basics of my Mandarin in Taiwan, and they have stuck with me ever since. So it's not just with XI2 vs. XI1 that I run afoul of the new tonal norms that have developed on the Mainland, there are countless other words where my older fashioned GUOYU is at odds with PUTONGHUA, both with regard to tone and other aspects of phonology. We've discussed some of these on Language Log before, so I won't repeat the evidence here, but when I'm in China I'm very conscious that my pronunciation of the words for "week", "research", "and" (HAN4 vs. HE2), "garbage", and so many other basic terms are not the same as the standards upheld in the PRC. I've often remarked how so many syllables that were formerly second or fourth tone in GUOYU have now become first tone in PUTONGHUA. Previously I didn't know how to explain this phenomenon, occasionally even attributing it to "linguistic engineering". You have given us the historical reasons for the changes that have occurred and are occurring. Shouldn't we write xiūxi instead? I guess this is the way it is actually pronounced in Mainland China and how we find it in several dictionaries. Is this where green ideas sleep? Apparently they want a rhyming phrase here, so they use xiào 笑 to go with rǎo 扰, and because they want the two phrases in parallel, they use 羞 xiū, which doesn't make all that much sense to me. Maybe it has something to do with the fact that 含羞草 is the name of an actual plant (Mimosa pudica)? Yes, this is where the green ideas sleep – and apparently dream – quite furiously. As Joao noted, the pinyin for 休息 is still incorrect. Just look it up in a Chinese dictionary: it's xiu1xi. There is no tone over "xi" in this compound word; it's "toneless," the 5th tonal option in Mandarin.